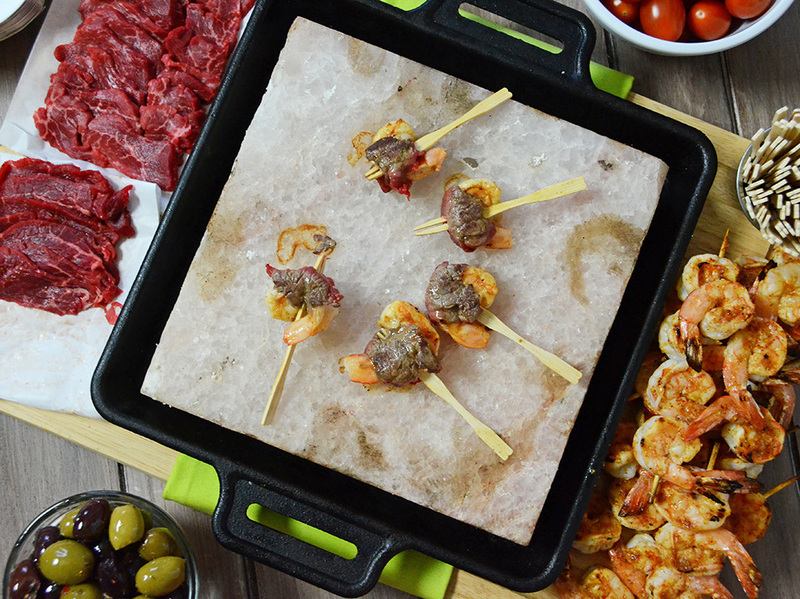 A fun, hands-on surf and turf appetizer cooked on a hot Himalayan salt block. This recipe is a fun, hands-on appetizer for tailgates, get-togethers or dinner parties. It combines the “do it yourself” aspect of the Polynesian/American-Chinese Pu Pu Platter with the brilliance of surf and turf – all in one bite! 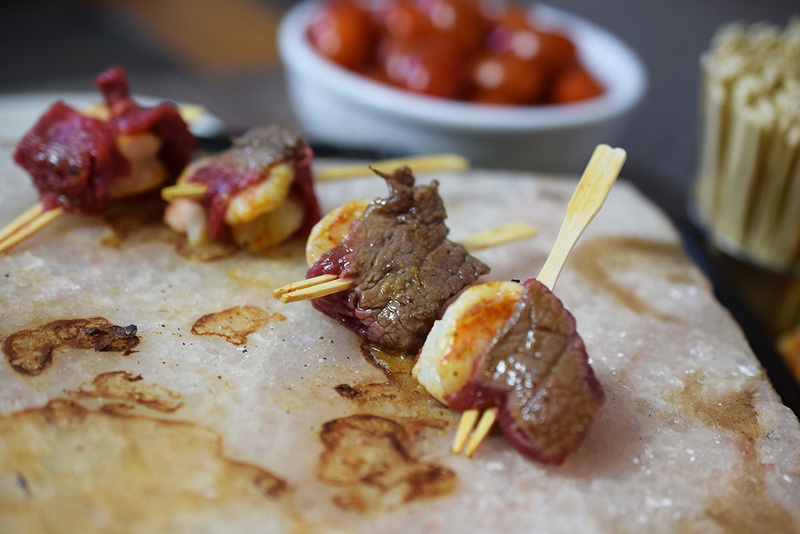 These mini-skewers take thinly shaved slices of beef tenderloin, wraps them around grilled shrimp and finishes cooking it on a 400°F Himalayan salt block. What is a salt block? Salt blocks are squares of salt, hewn out of massive salt deposits. They are popular with grill enthusiasts. 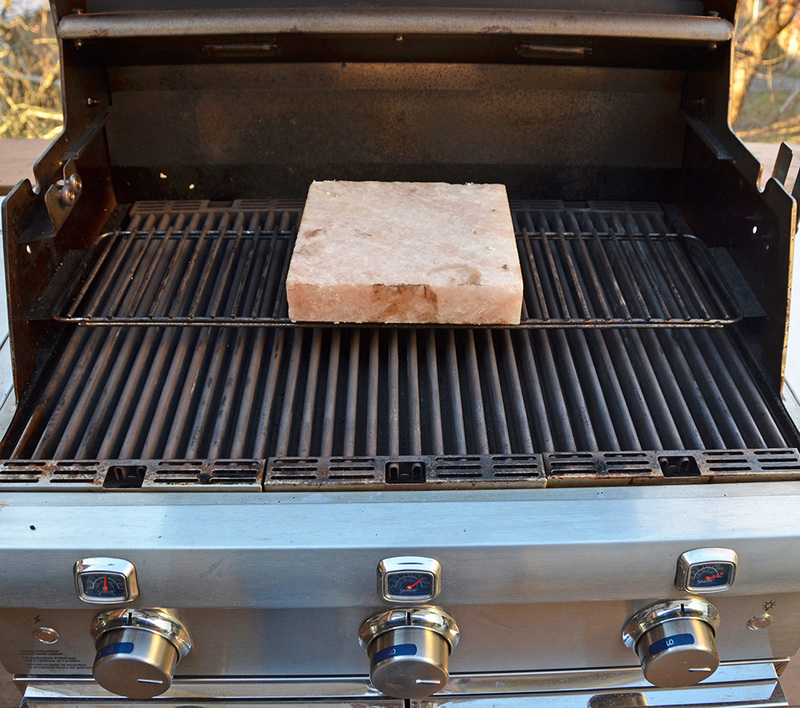 Use salt blocks, like the one shown below, in a similar fashion to griddles, grill toppers or soapstones. You can find salt blocks online, at grilling outlets and at culinary stores. You can use them as a griddle plate on the grill. For example, a griller can cook a steak on a heated salt block on the grill. Other than the “hey that’s cool” factor, salt blocks have no real advantage over other metal or soapstone griddles. I find their value lies in using them to serve appetizers to guests. 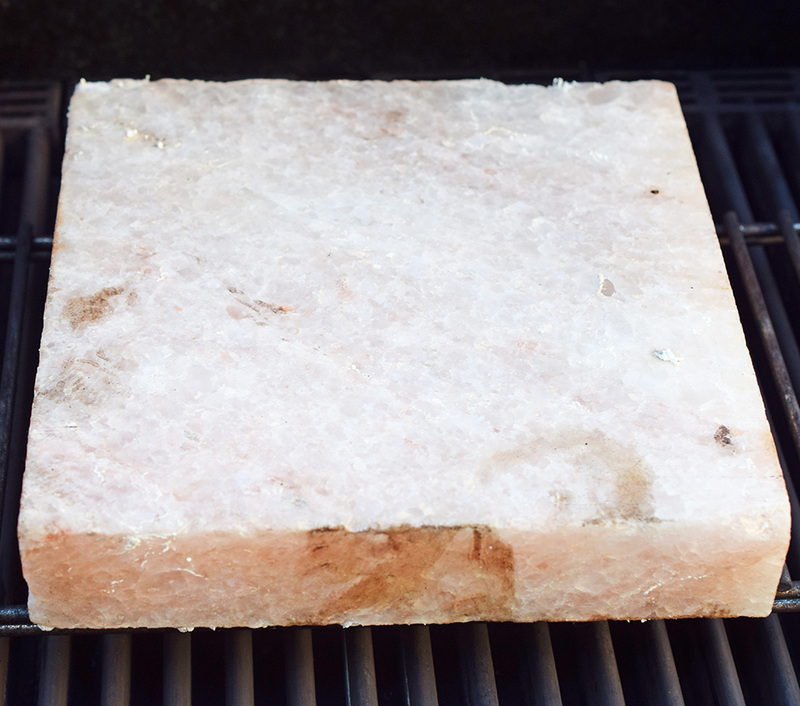 I like to use the salt block for guests to warm or cook appetizers themselves. This engages your guests and breaks the ice. I think it is “foodertainment” like the Pu Pu Platter or a fondue set up. It is important to do this slowly and according to supplier instructions. Heating a salt block too quickly can cause it to crack. Mix together the ingredients in a small bowl and set aside. Whisk together the orange juice, lemon juice, and shrimp seasoning. Slowly add the oil while whisking. Taste and add a pinch or two of salt, as needed. Place the shrimp in a gallon zip top bag. Pour the marinade in, press out the excess air, and seal. Let marinade, refrigerated, for 30 minutes. 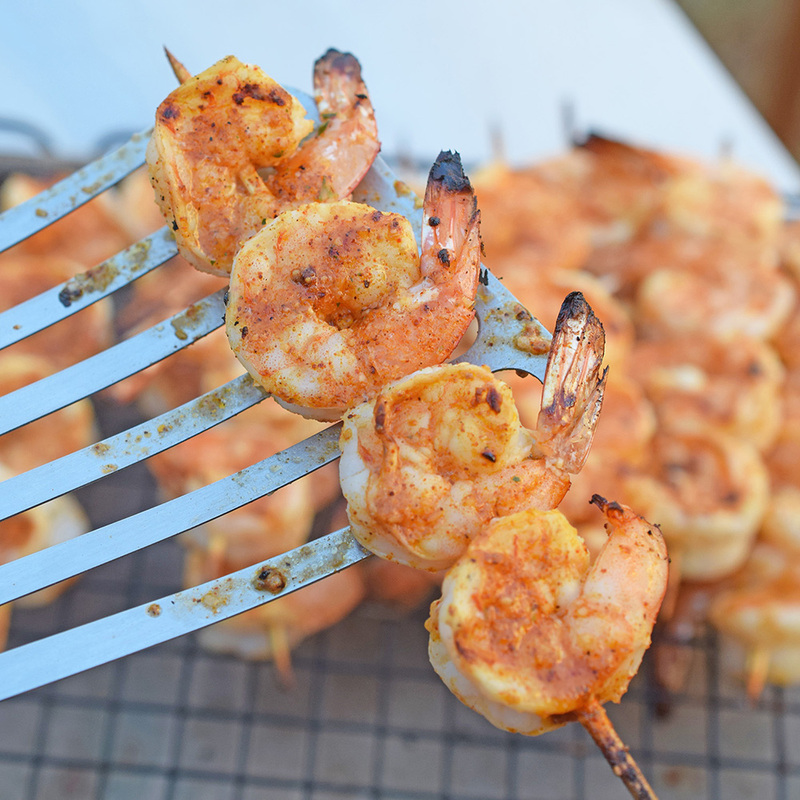 Remove the shrimp from the marinade and place on bamboo skewers. Season both sides with shrimp seasoning. Grill for 2 minutes per side over a hot grill. Using protective gloves, place the salt block on a heat resistant trivet or holder. 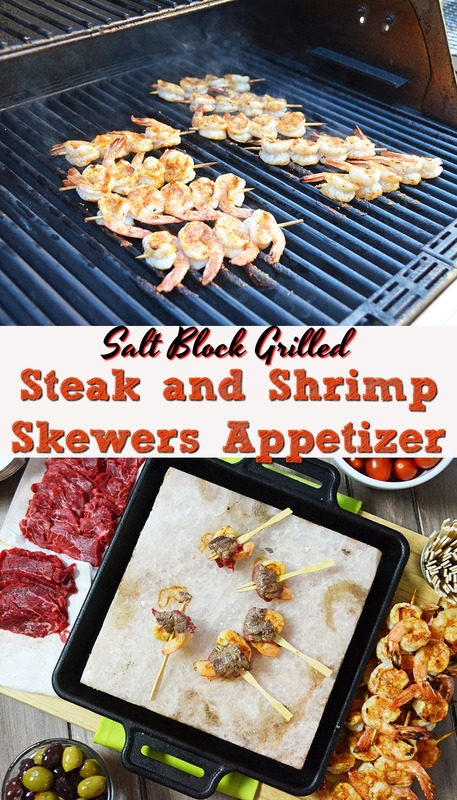 Surround the block with the sliced raw beef, cocktail skewers, the shrimp, and beef seasoning. First, remind them that the salt block is 400°F. 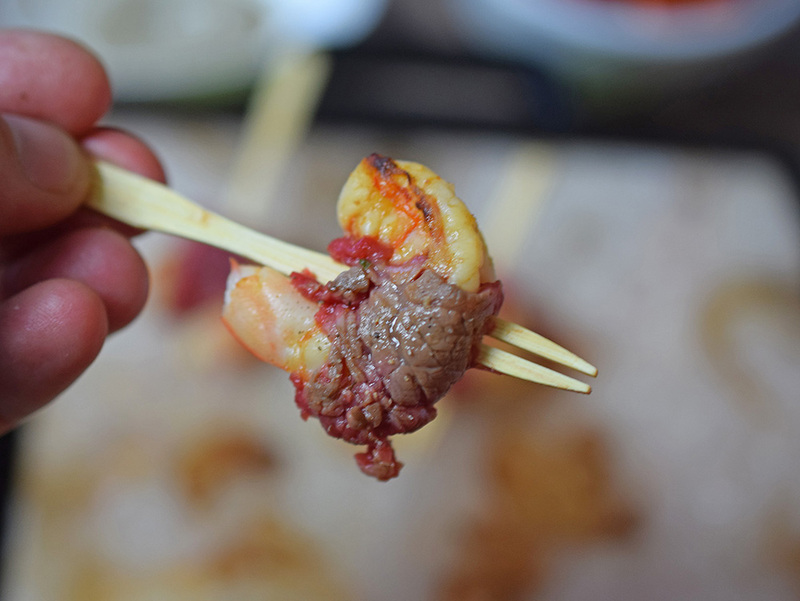 Take a strip of steak and wrap it around a shrimp. Secure it with a cocktail skewer or bamboo fork. Place it on the salt block until the first side is browned, 30 seconds to 1 minute. Flip, season with a pinch of the beef seasoning and cook until the second side is cooked. 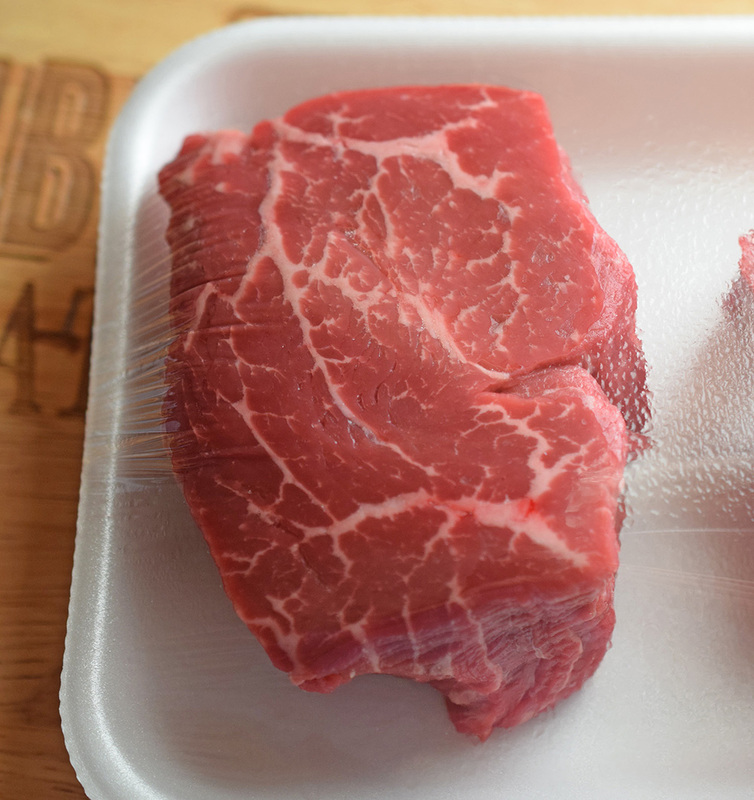 Look for abundant marbling and a bright red color when you are selecting your beef fillet (aka filet mignon). You should avoid those that are reddish-purple or light red. These are signs the pH of the meat was too high or too low. Also, skip any brown steaks. If it has excessive browning, it has started to oxidize. Heat salt blocks up slowly, or they can shatter. I put mine in the SABER Elite SSE 1500 with the secondary rack in the lower position. Then I turn the two outer burners on low for 20 minutes. Next, I turn the center burner on low heat and let that go for 20 minutes. Finally, I bump the heat up gradually on the outer burners for another 20-30 minutes, until the grill cooking temperatures reach 500°F. 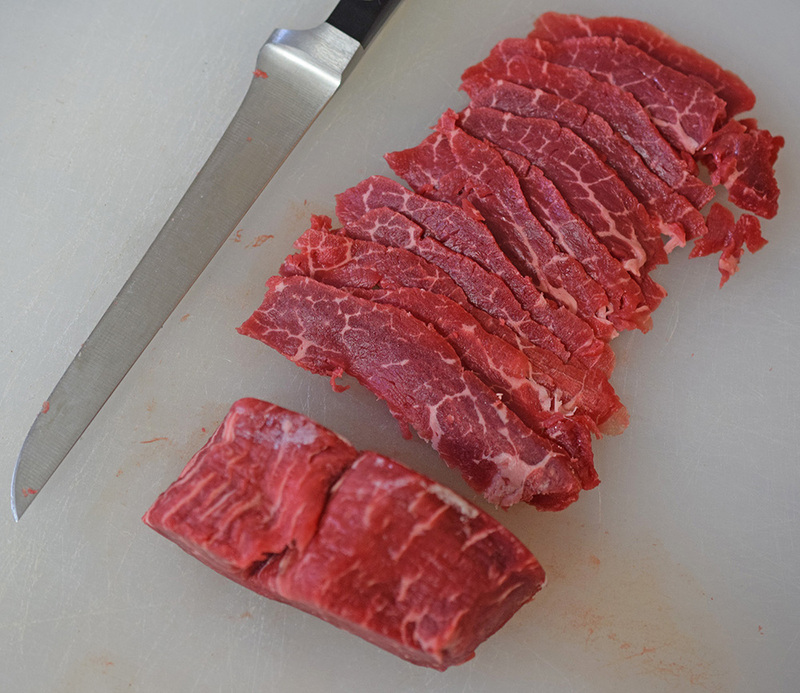 Shave the fillet as thinly as you can. It helps to put it in the freezer for 20-30 minutes immediately before slicing it. 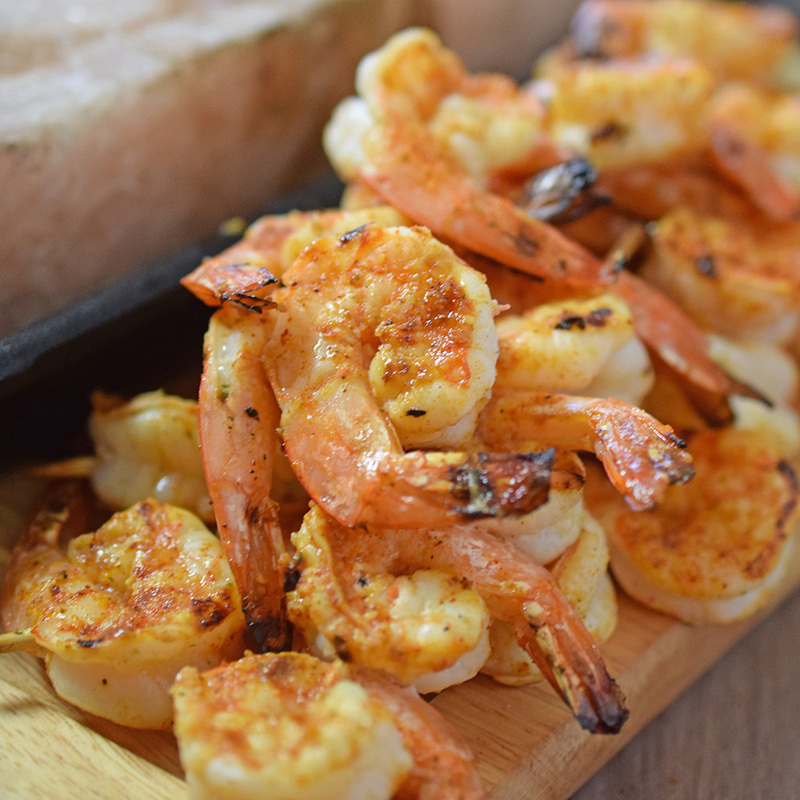 I could have used the salt block to grill the shrimp. But the Saber’s infrared cooking system does a phenomenal job of grilling seafood quickly without drying it out. Besides, my salt block measures just 8″ x 8″ and all of this shrimp wouldn’t fit on it. Shrimp come with a built-in timer – their tails. 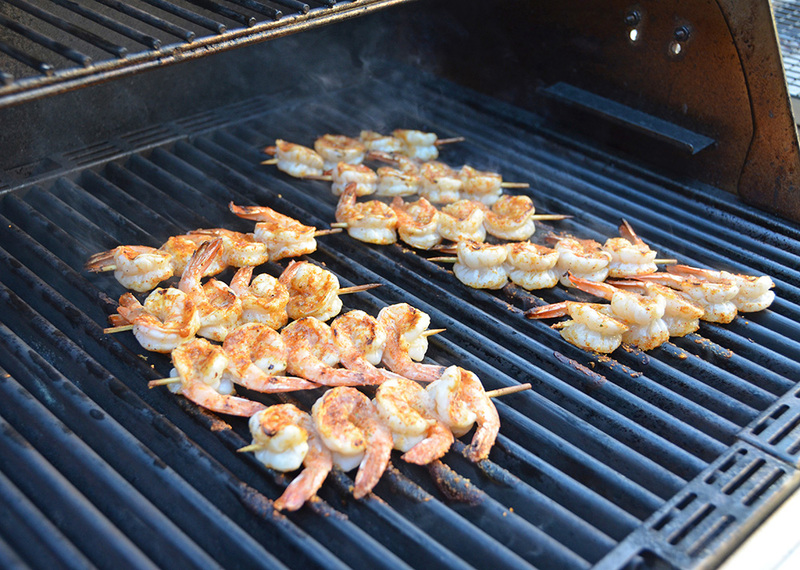 When the tails turn bright pink, the shrimp have finished grilling. I grilled these 2 1/2 minutes per side on a hot grill. Remove the shrimp tails. You can do this either when cleaning the shrimp or after you have cooked the shrimp. I prefer removing them after cooking because I use the tail for visual cues as noted above. Take a shrimp and wrap it with a slice of beef fillet. Next, secure the steak with a cocktail skewer. Next, place the appetizer on the hot salt block and let it cook until done. This will be about 30 seconds a side when the block first comes off. After the block begins to cool, the cook times will take longer. The skewers have finished cooking when the steak is mostly browned but not cooked through. The salt block doesn’t add much seasoning, especially with such a short cook duration. So, while they are cooking, season the beef with the finely ground beef rub or salt and pepper. 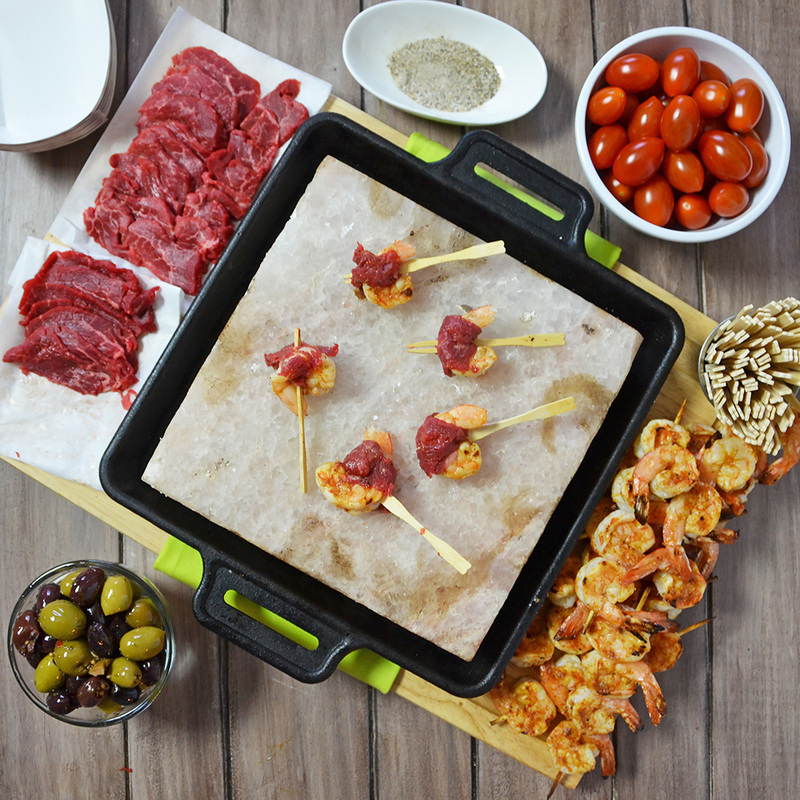 The tender bite of beef, boldly seasoned shrimp and getting your guests involved make this an ideal appetizer for just about any occasion.